Organizations currently performing in a highly competitive environment are increasingly interested in adopting advance technologies for their business operations. One of the places where these technologies are widely used is social networking (or commonly known as social media). Social media is not only used for entertainment and socialization, but also used for business purposes in organizations. However, knowledge about the impact of use of social media on employee job performance is limited. Therefore, the purpose of his empirical research was to investigate the effect of use of social media usage on employee job performance in the service providing sectors. Survey data were collected from 205 respondents through the simple random sampling technique. A Structural Equation Modelling method was employed for data analysis. Results demonstrated a positive and significant relationship between use of social media and employee job performance. Since the use of social media is inevitable in work environments, management in organizations should find ways to get the maximum benefit of its use in business processes. Günümüz yüksek rekabet ortamında faaliyet gösteren işletmeler gelişmiş teknolojilerini artan şekilde iş süreçlerine uyarlayıp kullanmaktadırlar. Gelişmiş teknolojilerin kullanım alanlarından biri de sosyal ağlardır (veya geniş kabul görmüş adıyla sosyal medyadır). Sosyal medya işletmelerde sadece eğlenme ve sosyalleşme amacıyla değil iş amaçları için de kullanılmaktadır. Fakat, sosyal medyanın personelin iş performansına etkisi hakkında yazında sınırlı bilgiye rastlanılmaktadır. Dolayısıyla, bu ampirik çalışmada sosyal medya kullanımının çalışanların iş performansına etkisinin hizmet işletmeleri kapsamında araştırılması amaçlanmıştır. Hizmet sektöründe faaliyet gösteren işletmelerinde, yüz yüze anket yoluyla rastgele seçilmiş 205 iş görenden veri elde edilmiştir. Veri analizinde yapısal eşitlik modellemesi tekniği kullanılmıştır. Araştırmada, sosyal medya kullanımı ile iş gören performansı arasında pozitif ve anlamlı ilişki olduğu belirlenmiştir. Araştırma sonucuna göre çalışanların işletmelerde sosyal medya kullanımının kaçınılmaz bir gerçek olduğu değerlendirilmiştir. Bu gerçekten hareketle yöneticilerin, çalışanların sosyal medyayı iş amaçlı kullanmaları yönünde bilgilendirmeleri ve hatta teşvik etmelerinin gerektiği söylenebilir. Bu şekilde hareket edildiğinde işletmeler iş süreçlerinde sosyal medyadan maksimum fayda elde edebilirler. Ali-Hassan, H., Nevo, D., & Wadec, M. (2015). Linking Dimensions of Social Media Use to Job Performance: The Role of Social Capital. Journal of Strategic Information Systems, 24(2015), 65-89. Agnihotri, R., Kothandaraman, P., Kashyap, R., & Singh, R. (2012). Bringing “Social” Into Sales: The Impact of Salespeople’S Social Media Use on Service Behaviors and Value Creation. Journal of Personal Selling & Sales Management, 32(3), 333–348. Amo, M. a. d. C. A. n. d., Lorenzo-Romero, C., & Borja, M. A. n. G. m. (2011). Classifying and Profiling Social Networking Site Users: A Latent Segmentation Approach. Cyberpsychology, Behavior, and Social Networking, 14(9), 547-553. Anandarajan, M., Simmers, C. A., & D’Ovidio, R. (2011). Exploring the Underlying Structure of Personal Web Usage in the Workplace. Cyberpsychology, Behavior, and Social Networking, 14(10), 577-583. Bartholomew, D. J., Knott, M., & Moustaki, I. (2011). Latent Variable Models and Factor Analysis: A Unified Approach. (Vol. 904): John Wiley & Sons. Behringer, N., & Sassenberg, K. (2015). Introducing Social Media for Knowledge Management: Determinants of Employees’ Intentions to Adopt New Tools. Computers in Human Behavior, 48, 290-296. Burgazoglu, H. (2013). Çok Değişkenli Kovaryans Analizi ve 360 Derece Performans Değerlendirmesi Üzerine Bir Uygulama. Master Thesis, İstanbul University, İstanbul. Cao, X., Guo, X., & Vogel, D. (2016). Exploring the Influence of Social Media on Employee Work Performance. Internet Research, 26(2), 529-545. Cao, X., Vogel, D. R., Guo, X., Liu, H., & Gu, J. (2012). Understanding the Influence of Social Media in the Workplace: An Integration of Media Synchronicity and Social Capital Theories Paper presented at the 45th Hawaii International Conference on System Sciences. Carr, C. T., & Hayes, R. A. (2015). Social Media: Defining, Developing, and Divining. Journal of Communication, 23, 46–65. Chang, T.-S., & Hsiao, W.-H. (2013). Factors Influencing Intentions to Use Social Recommender Systems: A Social Exchange Perspective. Cyberpsychology, Behavior, and Social Networking, 16(5), 357-363. Chen, C.-F. (2014). The influences of university interns’ job characteristics, work value, and job performance. Revista de Cercetare si Interventie Sociala, 47(1), 204-219. Chen, C.-W., & Lin, C.-S. (2014). Building a Sense of Virtual Community: The Role of the Features of Social Networking Sites. Cyberpsychology, Behavior, and Social Networking, 17(7), 460-465. Choudhary, N., Naqshbandi, M. M., & Philip, P. J. (2017). Employee Job Performance: The Interplay of Leaders’ Emotion Management Ability and Employee Perception of Job Characteristics. Journal of Management Development, 36(8), 1087-1098. Dunne, A., Lawlor, M.-A., & Rowley, J. (2010). Young People’s Use of Online Social Networking Sites – A Uses and Gratifications Perspective. Journal of Research in Interactive, 4(1), 46-58. Gao, F., Wang, J., & Wanga, S. (2019). Understanding Knowledge Workers’ Job Performance: A Perspective of Online and Offline Communication Networks. Enterprise Information Systems, 13(1), 107-131. doi:10.1080/17517575.2018.1458996. Kane, G. C., Alavi, M., Labianca, G. J., & Borgatti, S. P. (2014). What’s Different about Social Media Networks? A Framework and Research Agenda. Mis Quarterly, 38(1), 274-304. Guegan, J. r. m., Nelson, J., & Lubart, T. (2017). The Relationship between Contextual Cues in Virtual Environments and Creative Processes. Cyberpsychology, Behavior, and Social Networking, 20(3), 202-206. Harari, M. B., Reaves, A. C., & Viswesvaran, C. (2015). Creative and Innovative Performance: A Metaanalysis of Relationships with Task, Citizenship, and Counterproductive Job Performance Dimensions. European Journal of Work and Organizational Psychology, 25(4), 495–511. Hox, J. J., & Bechger, T. M. (2006). An Introduction to Structural Equation Modeling. Family Science Review, 354-373. Jex, & M, S. (1998). Stress and Job Performance: Theory, Research, and Implications for Managerial Practice. Thousand Oaks, CA: Sage Publications. June, S., & Mahmood, R. (2011). The Relationship between Person-Job Fit and Job Performance: A Study among the Employees of the Service Sector Smes in Malaysia. International Journal of Business, Humanities and Technology, 1(2), 95-105. Kane, G. C. (2015). Enterprise Social Media: Current Capabilities and Future Possibilities. MIS Quarterly Executive, 14(1), 1-16. Kaplan, A. M., & Haenlein, M. (2012). Social Media: Back To The Roots And Back To The Future. Journal of Systems and Information Technology, 14(2), 101-104. Kim, B. (2012). Understanding Key Factors of Users’ Intentions to Repurchase and Recommend Digital Items in Social Virtual Worlds. Cyberpsychology, Behavior, and Social Networking, 15(10), 543-550. Kjaerulff, C. (2015). Organizational Structure’s Influence on Social Media. (Master Thesis), Aarhus University, Denmark. Koopmans, L., & Bernaards, C. M. (2014). Construct Validity of the Individual Work Performance Questionnaire. Journal of Environmental Medicine, 56(3), 331-337. Koopmans, L., Buuren, S. v., & Beek, A. J. v. d. (2013). Development of an Individual Work Performance Questionnaire. International Journal of Productivity and Performance Management, 62(1), 6-28. Liu, M. M. R. M., & Hsiang, S. M. (2015). Planning For Uncertainty: Use of Structural Equation Modelling To Determine the Causal Structure of Time Buffer Allocation. Construction Management and Economics, 33(10), 783–798. Louie H. M. Wong, Carol X. J. Ou, Davison, R. M., Hui Zhu, & Zhang, C. (2016). Web 2.0 and Communication Processes at Work: Evidence from China. IEEE Transactions On Professional Communication, 59(3), 230-244. Lu, B., Guo, X., & Luo, N. (2015). Corporate Blogging and Job Performance: Effects of Work-Related and Nonwork-Related Participation. Journal of Management Information Systems, 32(4), 285–314. Macnamara, J., & Zerfass, A. (2012). Social Media Communication in Organizations: The Challenges of Balancing Openness, Strategy, and Management. Journal of Strategic Communication, 6, 287–308. Marsh, H., Morin, A. J. S., Parker, P. D., & Kaur, G. (2014). Exploratory Structural Equation Modeling: An Integration of the Best Features of Exploratory and Confirmatory Factor Analysis. Annual Review of Clinical Psychology, 10, 85-110. Nga Ling Chan, & Guillet, B. D. (2011). Investigation of Social Media Marketing: How Does the Hotel Industry in Hong Kong Perform in Marketing on Social Media Websites? Journal of Travel & Tourism Marketing, 28(4), 345–368. Odoom, R., Anning-Dorson, T., & Acheampong, G. (2017). Antecedents of Social Media Usage and Performance Benefits in Small- and Medium-Sized Enterprises (SMEs). Journal of Enterprise Information Managemet, 30(3), 383-399. Özdemir, S., & Erdem, R. (2016). Sosyal Medyanin Örgüt İçi İletişimdeki Rolü. MANAS Journal of Social Studies, 5(4), 247-269. Pan, B., & Crotts, J. C. (2012). Theoretical Models of Social Media, Marketing Implications, and Future Research Directions. in “Social Media in Travel, Tourism and Hospitality: Theory, Practice and Cases” (ed. Sigala, M., Christou, E., & Gretzel, U. ), 73-85, Ashgate, UK. Pudliner, B. A., Brey, E. T. ve Choi, H.-G. (2015). The Emergence of Social Media: A Research Narrative Review. Society for Marketing Advances Proceedings. Pulakos, E. D., Arad, S., & Donovan, M. A. (2000). Adaptability in the Workplace: Development of a Taxonomy of Adaptive Performance. Journal of Applied Psychology, 85(4), 612-624. Reitz, A. (2012). Social Media’s Function in Organizations: A Functional Analysis Approach. Global Media Journal, 5(2), 41-56. Schreiber, J. B., Nora, A., Stage, F. K., Barlow, E. A., & King, J. (2006). Reporting structural equation modeling and confirmatory factor analysis results: A review. The Journal of Educational Research, 99(6), 323-338. Stone-Romero, E. F., Alvarez, K., & Thompson, L. F. (2009). The Construct Validity of Conceptual and Operational Definitions of Contextual Performance and Related Constructs. Human Resource Management Review, 19, 104-116. Usher, W. (2011). Types of Social Media (Web 2.0) Used by Australian Allied Health Professionals to Deliver Early Twenty-First-Century Practice Promotion and Health Care. Social Work in Health Care, 50, 305–329. Varotto, A., Gamberini, L., Spagnolli, A., Martino, F., & Giovannardi, I. (2016). The Persuasive Effect of Social Network Feedback on Mediated Communication: A Case Study in a Real Organization. Cyberpsychology, Behavior, and Social Networking, 19(3), 193-201. Veale, J. F. (2014). Edinburgh Handedness Inventory – Short Form: A Revised Version Based On Confirmatory Factor Analysis. Laterality: Asymmetries of Body, Brain and Cognition, 19(2), 164 177. Walker, J., & Maddan, S. (2013). Statistics in Criminology and Criminal Justice. (4 ed. ): Jones & Bartlett Learning. Walker, J. T., & Maddan, S. (2013). Statistics in Criminology and Criminal Justice: Analysis and Interpretation (4th Ed. ): Jones & Bartlett Learning. Wang, M.-H., Yang, T.-Y., & Chen, Y.-S. (2016). How Workers Engage In Social Networking Sites At Work: A Uses and Gratification Expectancy Perspective. International Journal of Organizational Innovation, 8(4), 161-176. White, M. (2014). The Impact of Social Media on Employee Performance – A Study by IBM Research. Retrieved from "http://www.intranetfocus.com/archives/1893"
Yong, A. G., & Pearce, S. (2013). A Beginner's Guide to Factor Analysis: Focusing on Exploratory Factor Analysis. Tutorials in Quantitative Methods for Psychology, 9(2), 79-94. Zhang, D. (2016). Business-to-Business (B2B) Media in UK: A Mixed Methods Study Using Product Variables to Assess the Impacts of Social Media on Product Strategies. Doctoral dissertation, University of Westminster. Zhang, X., Gao, Y., Yan, X., de Pablos, P. O., Sun, Y., & Cao, X. (2015). From E-Learning to Social-Learning: Mapping Development of Studies on Social Media-Supported Knowledge Management. Computers in Human Behavior, 51, 803-811. ISNAD ÇETİNKAYA, Ali Şükrü , RASHID, Muhammad . "The Effect of Use of Social Media on Employee job Performance". 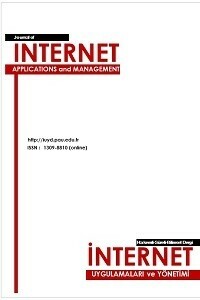 Journal of Internet Applications and Management 9 / 2 (December 2018): 5-20.